The last thing on your mind when your wife or husband arrives home after a 4 to 18 month tour, is capturing all this love — on film. Most people are so overwhelmed with emotions they forget to simply point and shoot the camera they are grasping of their child’s first hug, or that single tear of relief from a mother being able to hold her twenty year old son again. 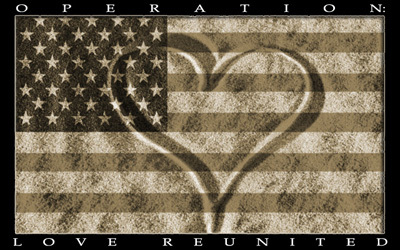 With the help of Operation: Love ReUnited and local photographers near your base, you can. The Operation helps those long months go by a little faster. It’s designed to capture moments that you will never remember. It’s art. It’s love. And it’s all made possible by artists wanting to give something back to those who make the United States what it is, and ask for nothing in return — but to come home.